A creative and vibrant multi-functional space frequented by the biggest names in the industry. Following previous refurbishment work in 2010 for Sony Music, Futurespace commenced work in 2012 on their front of house, informal breakouts and private meeting area for Sony Music’s artists and staff. The design brief was to reflect the vibrant and creative culture of Sony Music yet present a professional image that attracts successful talent. Futurespace has created an industrial feel that reflects their history in Australia and reputation as industry leaders. The spaces are flexible and multi-functional with an active and buzzing atmosphere that is inviting for artists and staff. 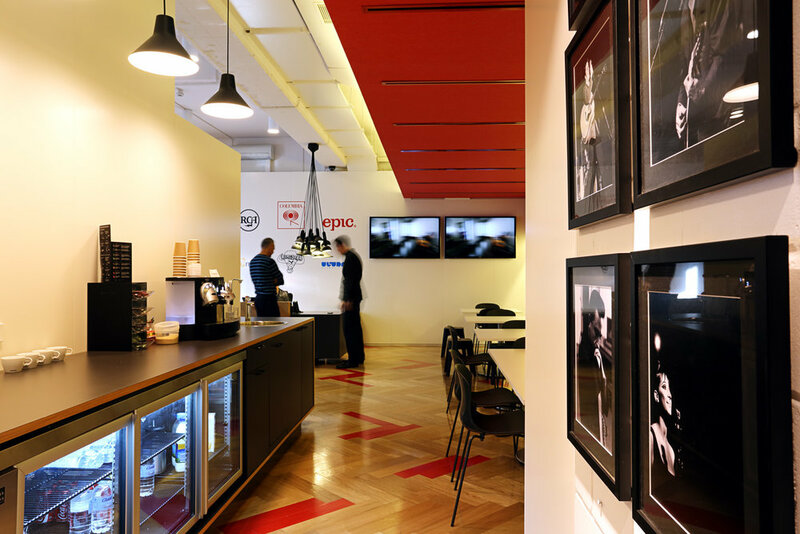 Sony Music’s artists feature throughout the space via large plasma screens playing music videos and large photographic artwork adorning the walls. The predominant display of Sony Music’s well known artists further strengthen and enhance their success. The breakout space visible from the reception area features an acoustic alcove that invites artists and staff to meet in an informal environment. Throughout the space selected timber floor elements and floating acoustic ceiling match the Sony Music brand colour. The space is able to be reconfigured to host events, presentations and performances. Unique and significant objects discovered through the demolition process feature throughout the space; the original brass handrail from the existing fit out, travertine stair finish, newspaper floor lining dating back to WWII and the original signage work come back together for a creative, vibrant and energetic space that is synonymous with Sony Music.